Protologue: Syst. nat. ed. 10, 2: 1144 (1759). Baobab, monkey-bread tree, dead-rat tree, cream-of-tartar tree (En). Baobab, calebassier du Sénégal, arbre de mille ans (Fr). Baobab, molambeira, imbondeiro, calabaceira, cabacevre (Po). Mbuyu, mkuu hapingwa, mkuu hafungwa, muuyu (Sw). Massive deciduous tree, up to 20(–23) m tall, trunk often of vast girth; bark smooth, variable in colour; branches stout near the trunk, young branches often tomentose; root system extending up to 2 m deep and horizontally further than the height of the tree. Leaves alternate, simple (in young trees and first leaves of the season in old trees) or digitately compound, at the apex of branches; stipules early caducous; petiole up to 16 cm long; compound leaves 5–7(–9)-foliolate, c. 20 cm in diameter; leaflets sessile or shortly stalked, elliptical, 5–15 cm × 1.5–7 cm, base cuneate, apex acuminate, mucronate, entire. Flowers solitary or paired, axillary, pendulous, bisexual; pedicel up to 90 cm long, tomentose; bracteoles 2, early caducous; calyx 3–5-lobed, 5–9 cm × 3–7 cm, shortly tomentose outside, velvety pubescent inside; petals 5, overlapping, very broadly obovate to oblate, 5–10 cm × 4.5–12 cm, base shortly clawed, apex rounded, white; stamens very numerous, united at base into a staminal tube 1.5–4.5 cm long, free part equally long, reflexed; ovary superior, 5–10-celled, style exserted c. 1.5 cm beyond anthers, stigma 5–10-lobed. Fruit a woody, indehiscent capsule, globose to ovoid or oblong-cylindrical, up to 40(–55) cm long, covered by velvety tomentum, filled with dry, mealy pulp, many-seeded. Seeds reniform, c. 1.5 cm × 1 cm, smooth, dark brown to black, with thick seedcoat. Seedling with hypogeal germination; cotyledons breaking free from testa; first leaves simple, narrowly linear; taproot swollen. Baum, D.A., 1995. 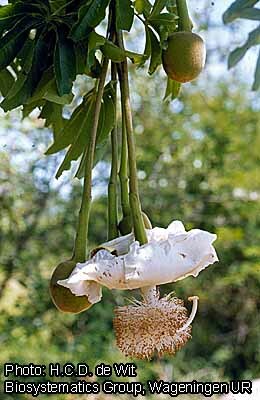 A systematic revision of Adansonia, Bombacaceae. Annals of the Missouri Botanical Gardens 82(3): 440–470. Baum, D.A. & Ogunima, K., 1994. A review of chromosome numbers in Bombacaceae with new counts for Adansonia. Taxon 43(1): 11–20. Gebauer, J., El-Siddig, K. & Ebert, G., 2002. Baobab (Adansonia digitata L.): a review on a multipurpose tree with promising future in the Sudan. Gartenbauwissenschaft 67(4): 155–160. Sidibé, M. & Williams, J.T., 2002. 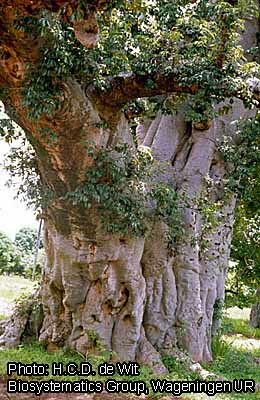 Baobab: Adansonia digitata. [Internet] International Centre for Underutilised Crops, Southampton, United Kingdom. http://www.icuc-iwmi.org/ resources.htm. January 2004. Addy, E.O.H, Salami, L.I., Igboeli, L.C. & Remawa, H.S., 1995. Effect of processing on nutrient composition and anti-nutritive substances of African locust bean (Parkia filicoidea) and baobab seed (Adansonia digitata). Plant Foods for Human Nutrition 48(2): 113–117. Anani, K., Hudson, J.B., De Souza, C., Akpagana, K., Tower, G.H.N., Amason, J.T. & Gbeassor, M., 2000. Investigation of medicinal plants of Togo for antiviral and antimicrobial activities. Pharmaceutical Biology 38(1): 40–45. Hudson, J.B., Anani, K., Lee, M.X., De Souza, C., Arnason, J.T. & Gbeassor, M., 2000. Further investigations on the antiviral activities of medicinal plants of Togo. Pharmaceutical Biology 38(1): 46–50. Mukamuri, B. & Kozanayi, W., 1999. Institutions surrounding the use of marketed bark products: the case of Berchemia discolor, Warburgia salutaris and Adansonia digitata. [Internet] Institute of Environmental Studies Workingpaper 17. http://www.ies.ac.zw/publications/working/wp17.htm. January 2004. Murray, S.S., Schoeninger, M.J., Bunn, H.T., Pickering, T.R. & Marlett, J.A., 2001. Nutritional composition of some wild plant foods and honey used by Hadza foragers of Tanzania. Journal of Food Composition and Analysis 14: 3–13. Scheuring, J.F., Sidibé, M. & Frigg, M., 1999. Malian agronomic research identifies local baobab tree as source of vitamin A and vitamin C. Sight and Life Newsletter 1: 21–24. Sidibé, M., Scheuring, J.F., Tembely, D., Sidibé, M.M., Hofman, P. & Frigg, M., 1996. Baobab: homegrown vitamin C for Africa. Agroforestry Today 8(2): 13–15. Touré, S.F., Michalet-Doreau, B., Traoré, E., Friot D. & Richard, D., 1998. Occurrence of digestive interactions in tree forage-based diets for sheep. Animal Feed Science and Technology 74(1): 63–78. Vollesen, K., 1995. Bombacaceae. In: Edwards, S., Mesfin Tadesse & Hedberg, I. (Editors). Flora of Ethiopia and Eritrea. Volume 2, part 2. Canellaceae to Euphorbiaceae. The National Herbarium, Addis Ababa University, Addis Ababa, Ethiopia and Department of Systematic Botany, Uppsala University, Uppsala, Sweden. pp. 186–189. von Breitenbach, F., 1985. Aantekeninge oor die groeitempo van aangeplante kremetartbome (Adansonia digitata) en opmerkinge ten opsigte van lewenstyd, groeifases en genetiese variasie van die spesie. (Notes on the growth rate of planted baobab trees (Adansonia digitata) and observations in respect of lifespan, growth phases and genetic variation of the species). Journal of Dendrology 5(1–2): 1–21. Bosch, C.H. & Sié, K. & Asafa, B.A., 2004. Adansonia digitata L. [Internet] Record from PROTA4U. Grubben, G.J.H. & Denton, O.A. (Editors). PROTA (Plant Resources of Tropical Africa / Ressources végétales de l’Afrique tropicale), Wageningen, Netherlands. <http://www.prota4u.org/search.asp>. This page was last modified on 29 April 2018, at 12:05.